Are Canadians Banking on the Bomb? 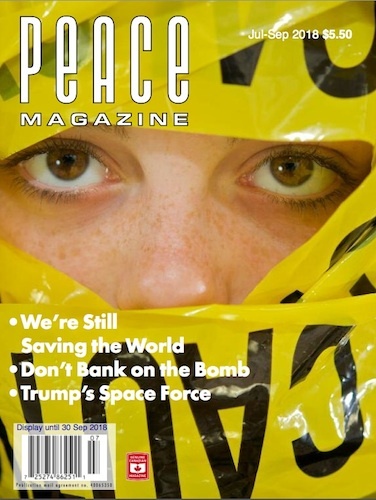 One of the easiest ways to take action against nuclear weapons is to make sure that your money is not invested in producing them, writes *Erin Hunt”. A peace group in the Netherlands, PAX, has provided lists of banks that finance organizations that do make components, and assigning them to a “Hall of Shame.” You will find Canadian banks on the list. If that’s where you keep your money, go complain. They won’t ignore you. 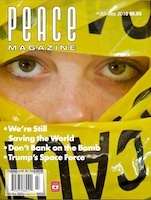 Peace Magazine is now producing a weekly video show! You can either watch one of our shows live on Facebook, or catch up afterwards on YouTube. It is difficult to figure out why the US military’s success at defeating ISIS on the ground means that the US should dominate space, as Erika Simpson observes. Can Democracy Survive in a Digital Age? Too often, technological innovations are celebrated without an adequate look at their social and environmental impacts, notes Rose Dyson. No municipal water treatment plant can remove tritium—hydrogen’s highly radioactive isotope, and one of the many contaminants at Fukushima—from drinking water, because you cannot filter water from water, as Gordon Edwards explains. Even in the most desperate of places, one can refuse to be a passive bystander. Maggie Ziegler shares the stories of rescuers and peacemakers over the years of state and paramilitary violence in the Central African Republic. It’s only three years since the end of the last UN Decade on Water, but some major problems have not gone away. Desertification—and the intersection between habitat loss, depletion of natural resources, food insecurity, and war—should be a central focus, writes René Wadlow. Review: International Peace Bureau, Move the Nuclear Weapons Treaty: a handbook for civil society and legislators, reviewed by David Harries.